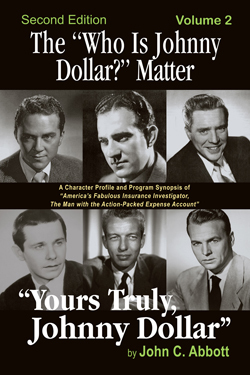 The second edition of "The Who is Johnny Dollar Matter?" consolidates the three-volume First Edition into just two volumes. Volume I covers the character background information, the Charles Russell, Edmund O'Brien, John Lund and the 5-part Bob Bailey programs. Volume II picks up with the 30-minute Bob Bailey programs, the Bob Readick and the Mandel Kramer programs. However, nothing has been deleted from the content. To the contrary, there has been a recent clarification of the Bob Readick and Mandel Kramer programs which provides a level of clarity to the last two years of broadcasts. The programs in Volume I are very well understood, but research has clarified the missing programs and determined which programs were pre-empted, and which are just missing. In Volume II, recent discoveries at the Thousand Oaks Library in Thousand Oaks, California have added to the catalog of programs in the Bob Readick series. Six programs have been added to the catalog, and these programs have helped to clarify the time-line of the remaining programs for both the Readick series, but the Kramer series as well. Volume II also adds a listing of AFRST/AFN sourced programs and an updated catalog of all known and missing Yours Truly Johnny Dollar programs. The second edition of "The Who is Johnny Dollar Matter?" is now available in both a hard cover and a soft cover version at: BearManor Media. An interview aired on WAMU is available on my interview page.